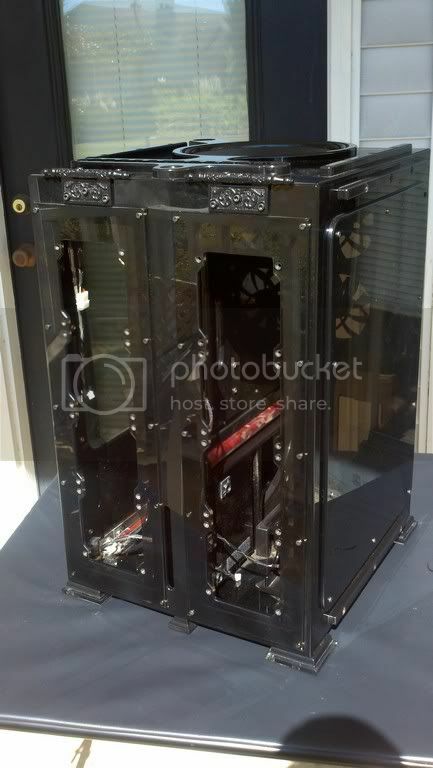 Overclock.net > Case Mods & Cases > Builds, Logs & Case Mods > [Restoration] Syrillian's Silentium. 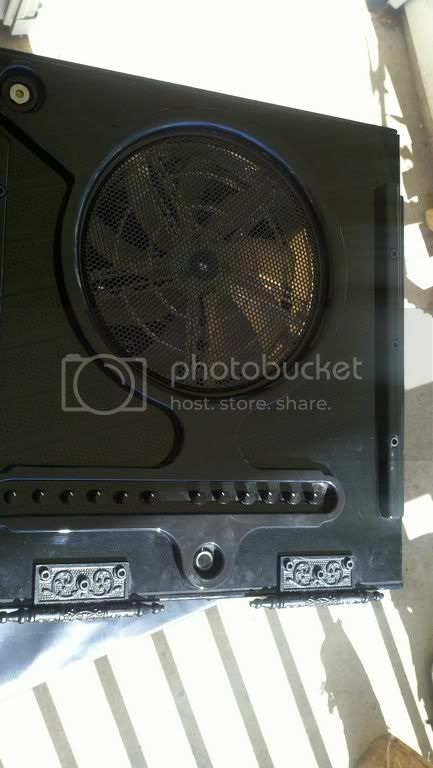 Dual 480mm rads, hand built acrylic case with carbon fiber. HEADING TO QUAKECON! [Restoration] Syrillian's Silentium. 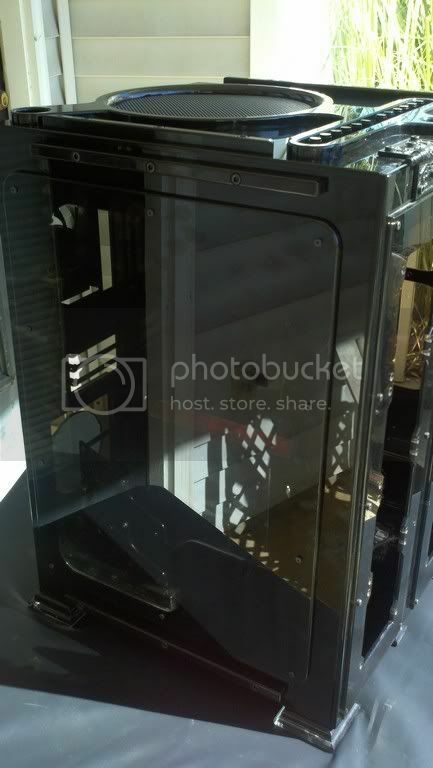 Dual 480mm rads, hand built acrylic case with carbon fiber. HEADING TO QUAKECON! Thank you for dropping by and welcome to the Silentium log! 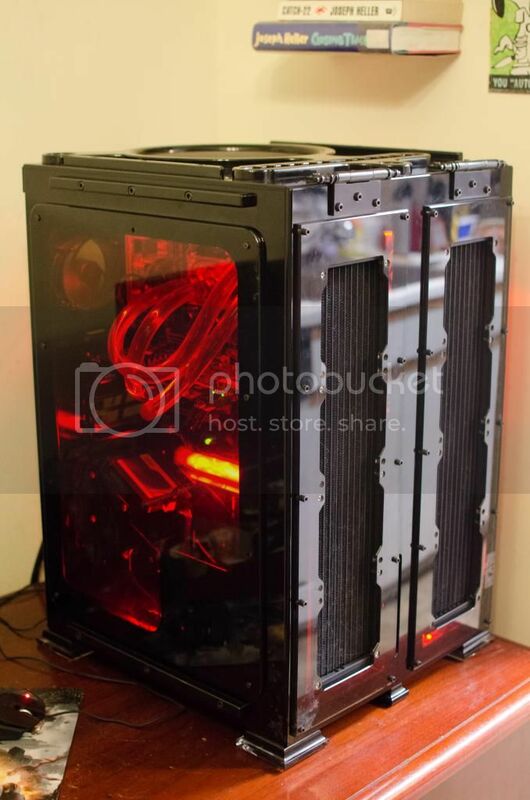 Long story short, this case (for those that don't know) was built in 2008 by a forum member, Syrillian, who is no longer with us. It is all hand cut and hand polished acrylic panels. 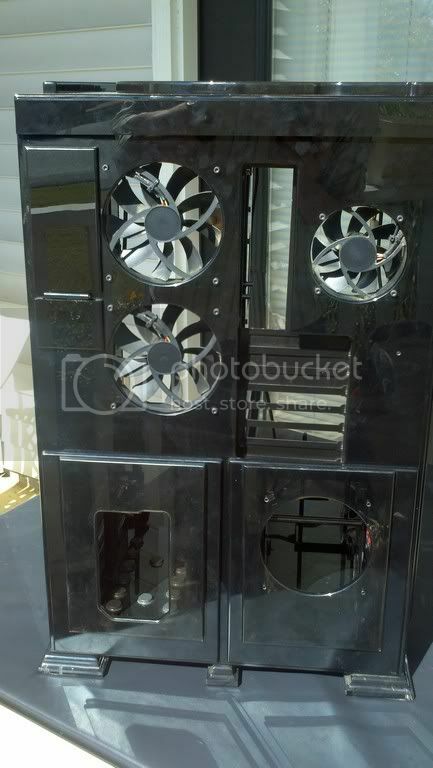 Originally built for a Q9550, EVGA 780i and 2x GTX280s, the case featured dual 480 rad water loops. After Syrillian's passing, the case ended up in my hands; I had helped Syr modify the original hinges and our staff felt I should have "first dibs" on it being the only other person to actually work on it. Since then, I've slowly rebuilt the broke pieces, added new hardware, and have been getting this case ready to go to Quakecon this year in Dallas. Below you'll see my OP when I first got the case. There's also a table of contents with relevant updates and a current hardware list. Enjoy the chaos! I've been trying to make this thread since last week. I still don't really know how to say it. As most, if not all, of you know, Syrillian passed away recently. I know it hit us hard, myself included. Syrillian was a good friend to me (and a lot of you too I know). Well, a few of our staffers and members went to Syr's memorial service. Smasherbasher, Tator Tot, and IEATFISH went with Syr's family and helped clean out his computer stuff, as you probably know from the RIP thread and Smasher's freebie thread. Well, Smasher contacted me to offer me Silentium (original thread here) as I had worked on the hinges for the build and had talked to Syrillian during the log. I very graciously said I would be honored to give this wonderful case a home. Well, neither of us trusted ye' olde shipping men to carry this thing: Smasher lives in California; I live in Alabama. So, a journey was spawned! Smasher was driving to Ohio for family and I had been tossing around the idea of visiting a friend in Houston this year. So, we planned our journeys around each other. My wife, Underdog1425, and myself drove to Houston; Smasher drove to northern Texas (Oklahoma City?). Then Smasher, Underdog, and I all trekked to Fort Worth where, at a Starbucks, the case was passed along. It was a very poignant moment. I was happy to meet a fellow staffer and see such a beautiful case. However, I wish we could have met for happier circumstances. Suffice to say the case made it home safe and sound (even after a 30minute talk with a Texas state trooper, who after pulling over an out of state car, couldn't believe that 3 people from Alabama would come to Fort Worth for a PC case ). Below you'll find the pictures of the case. Some of its pieces had been broken loose from when it was originally moved from Syrillian's house. I had to repair a few pieces. 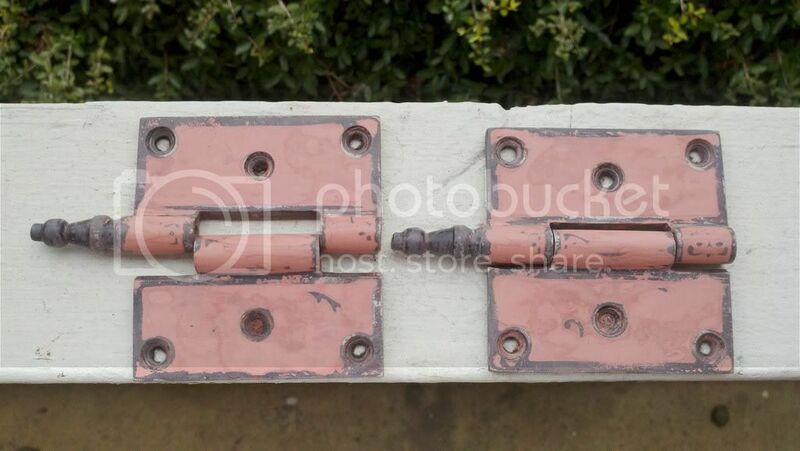 I also plan on bondo'ing these hinges the way Syrillian wanted them. 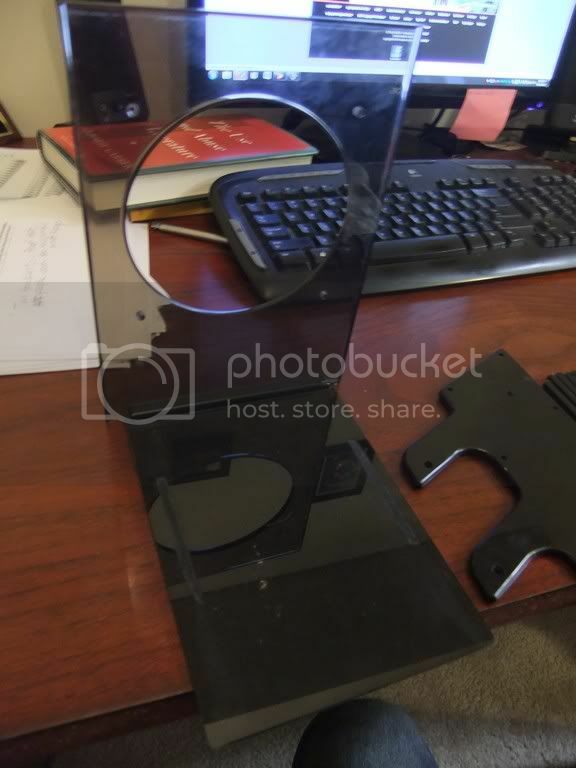 If anyone remembers, I smoothed a set of hinges for him but they ended up being the wrong size and Syr wanted to go ahead and complete the case. I'm glad I now have the opportunity to finally have these the way he wanted them. 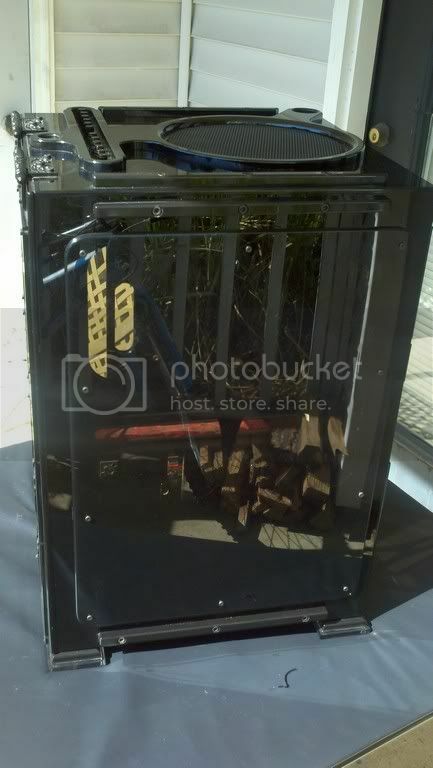 I'll also be getting some equipment for my own PC so I can house it in Silentium (mainly 480 rads or some kind of 480 rad grills to cover the gaping holes in the front). This won't be a fast log or anything, but I wanted to share this case with everyone and let you all have a chance to just talk and have some camaraderie. Thanks everyone. ~Repo, or, as Syr would say "_/\_"
Where is Repo sitting at for Quakecon this year? B56-1 (link goes to BYOC map)! January 7, 2012 - Priming the hinges and finally getting painted! 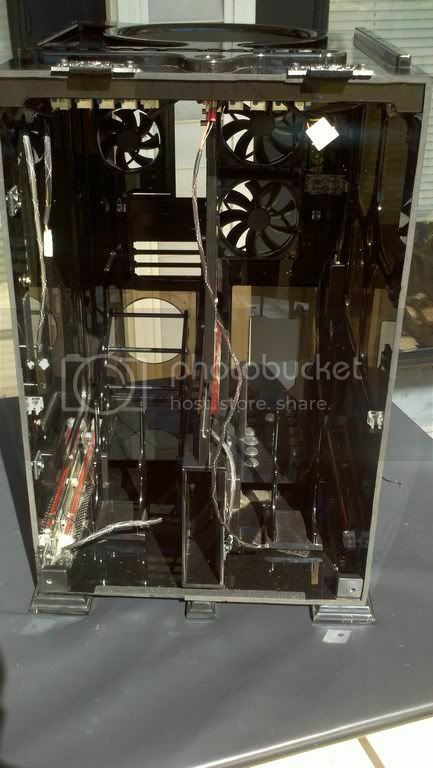 January 7, 2012 - Installing current 775 hardware into the case and getting everything plumbed in. Pics of everything installed and on my desk! 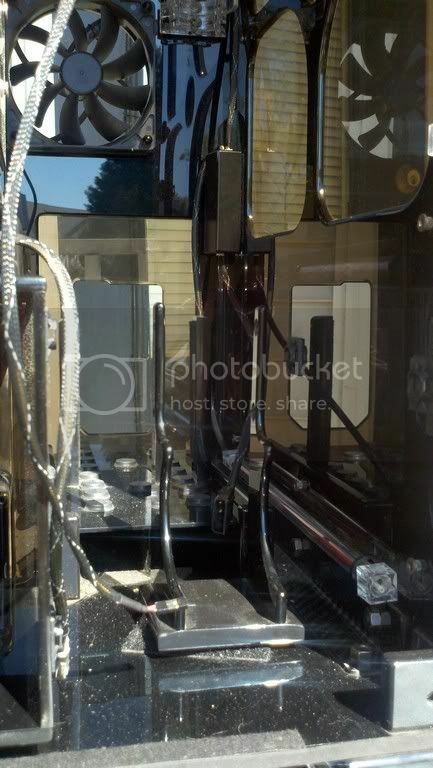 May 5, 2012 - Purchased replacement reservoirs. 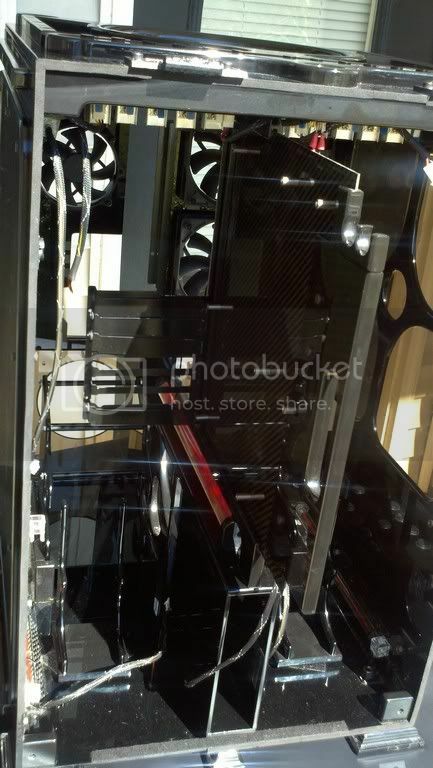 May 4, 2014 - Installing the single rad and block into my daily use case, the NZXT Phantom 820. 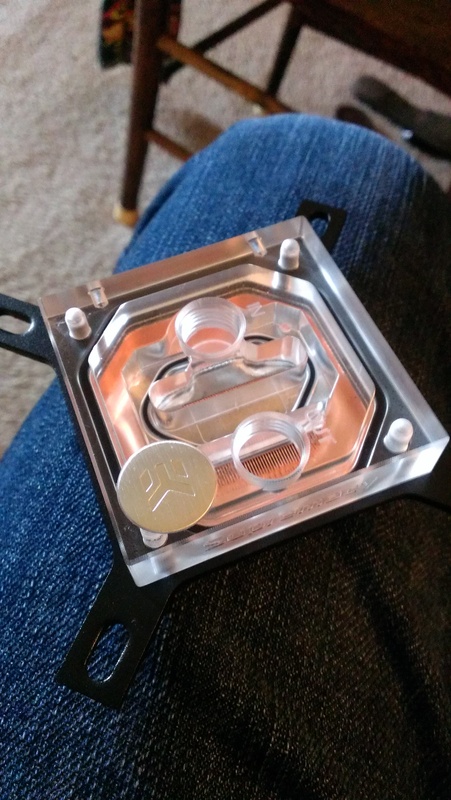 Misc shots of waterblock. 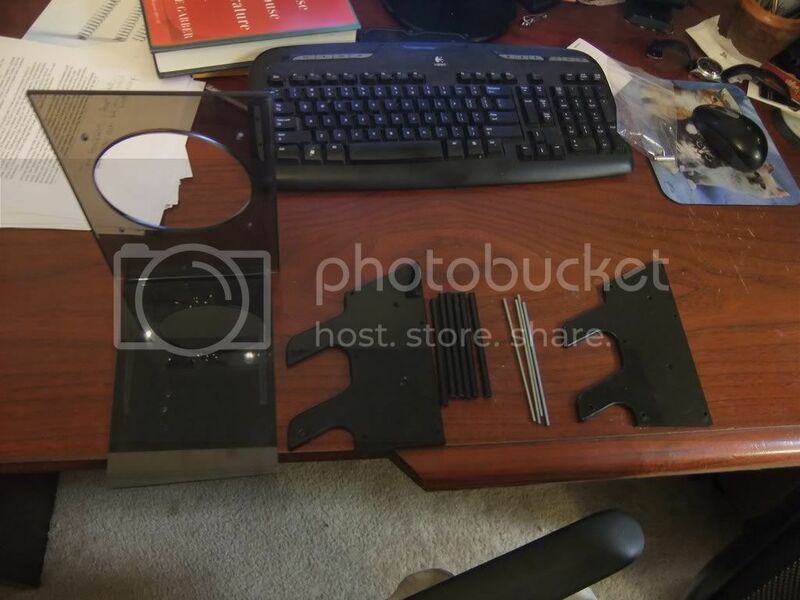 June 19, 2014 - New(ish) parts arrive: lapped i7 930 and Asus motherboard. 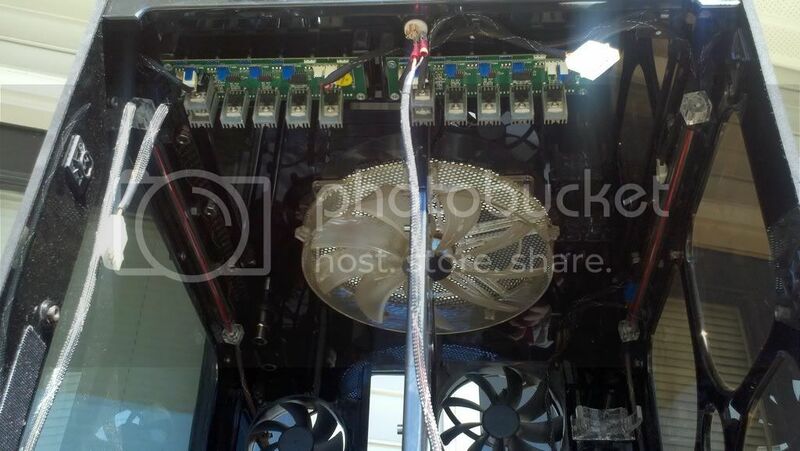 June 22, 2014 - Fans, cpu, mobo. 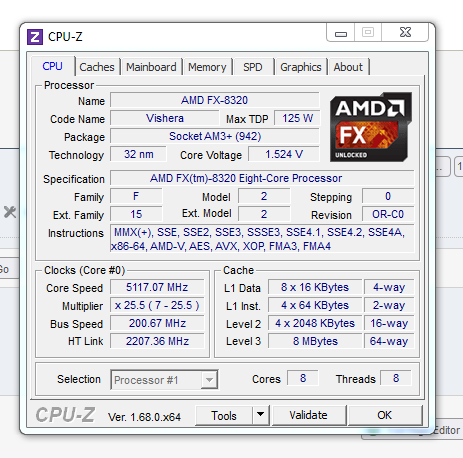 Modding the ASUS P6X58 Premium and further lapping on the i7 930. Rest of the water loop is ordered. 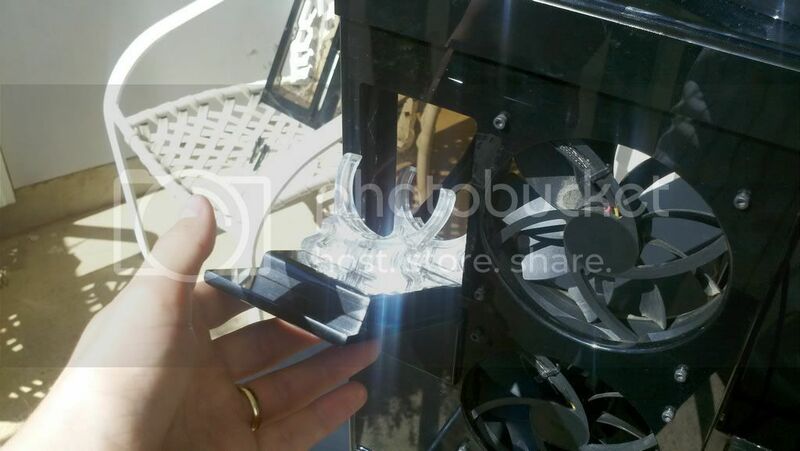 June 26, 2014 - Water parts arrive (Supremacy GPU block, Primochill tubing, Bitspower fittings, etc), lapping the GPU waterblock, and starting to install pieces. 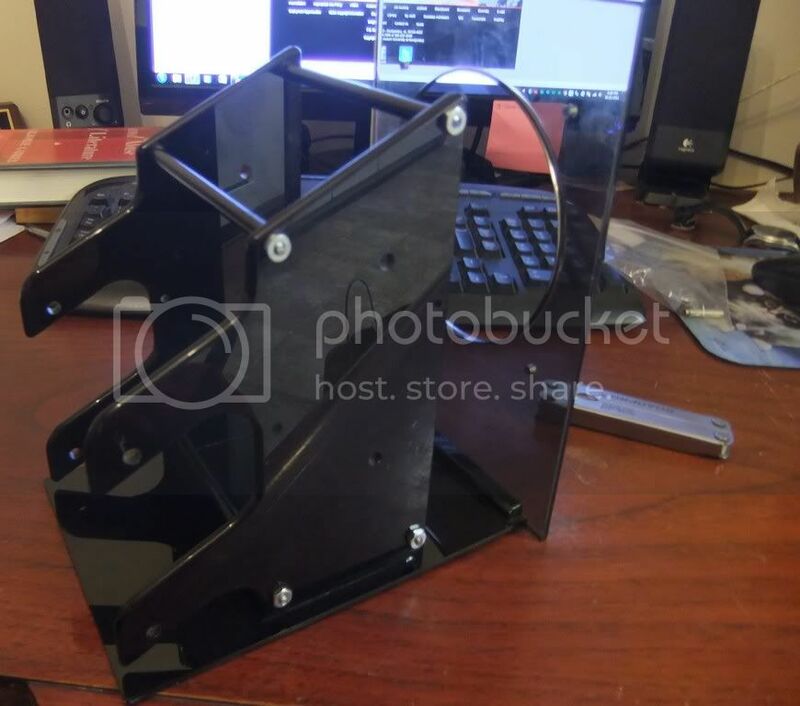 June 28, 2014 - Lapping the CPU block and CPU, mounting water blocks to board and gpu, mounting rads to front door, and beginning to plumb the water loop. 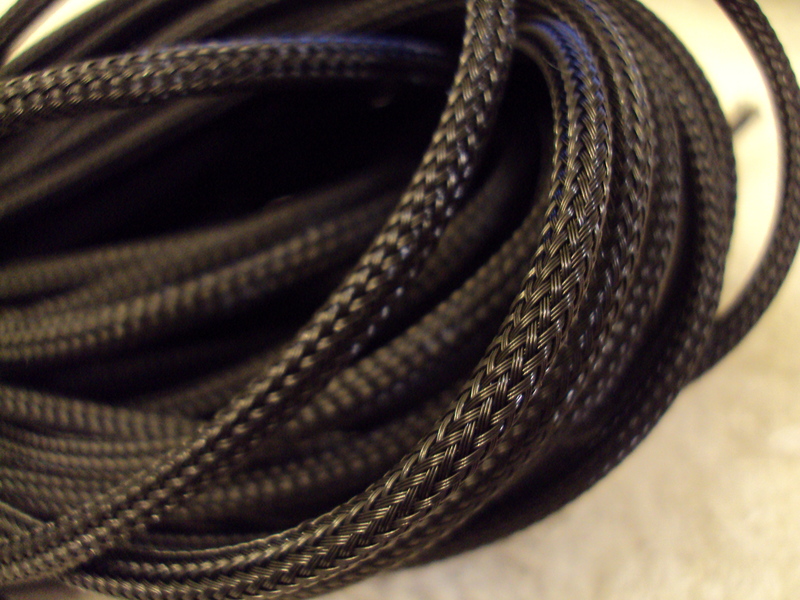 July 1, 2014 - Lutro0's sleeving donation arrives! Unboxing some goodies and sleeving a wire or two to see how good the Teleios sleeving looks. 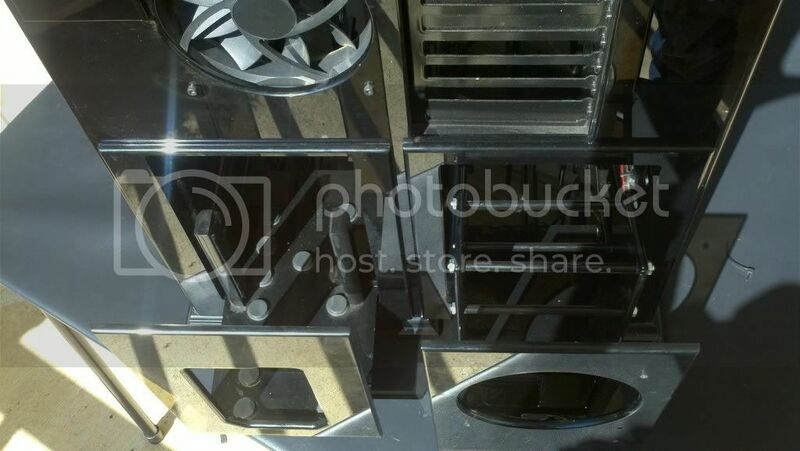 July 2, 2014 - Radiator fans all wired together. 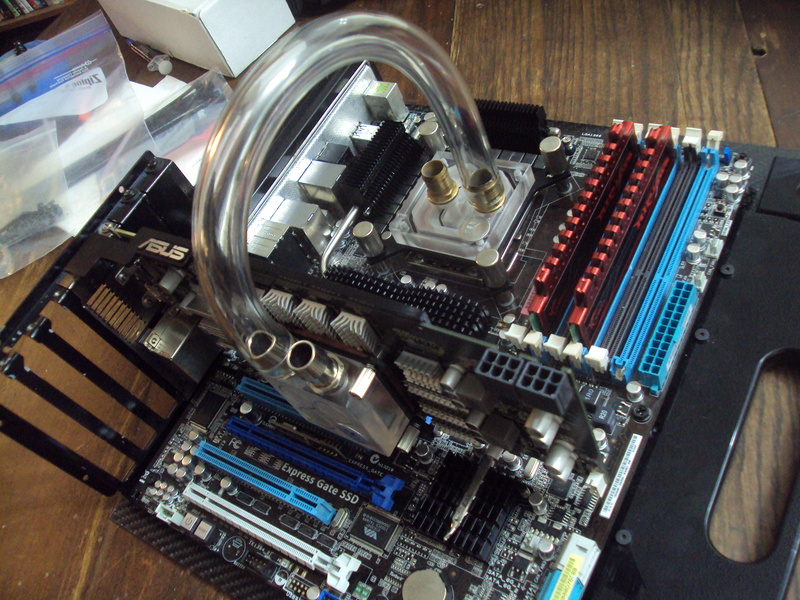 July 6, 2014 - Part 1 of 2: Finished sleeving all the cables, wiring in lights/case accessories, water loop goes in and is leak tested. 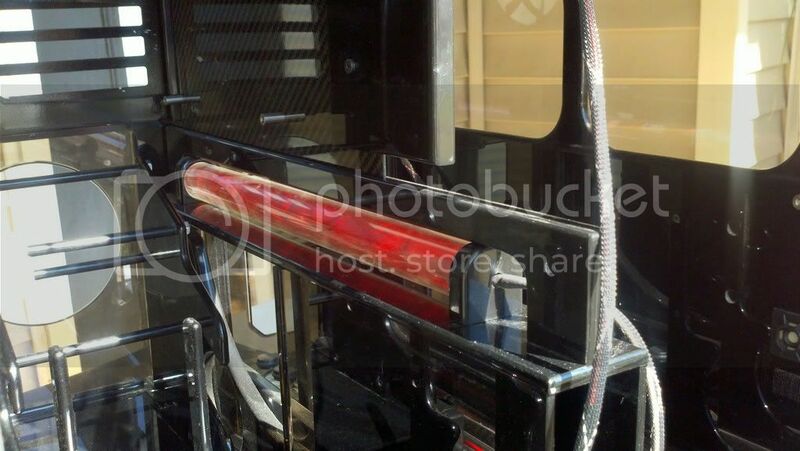 July 6, 2014 - Part 2 of 2: Water loop hooked up, filled, and leak tested. And NIGHT shots with lights! 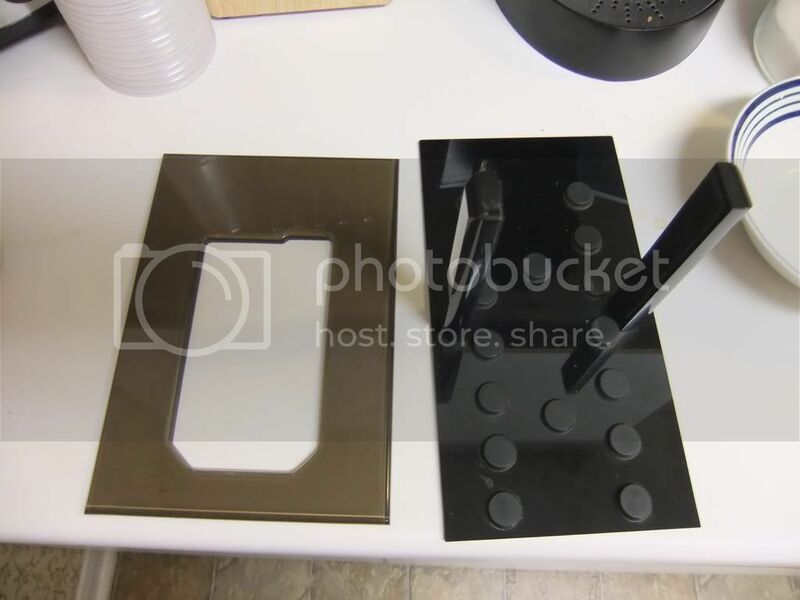 July 11, 2014 - Final update for large items: how the drain system works and a special project made just for the build. 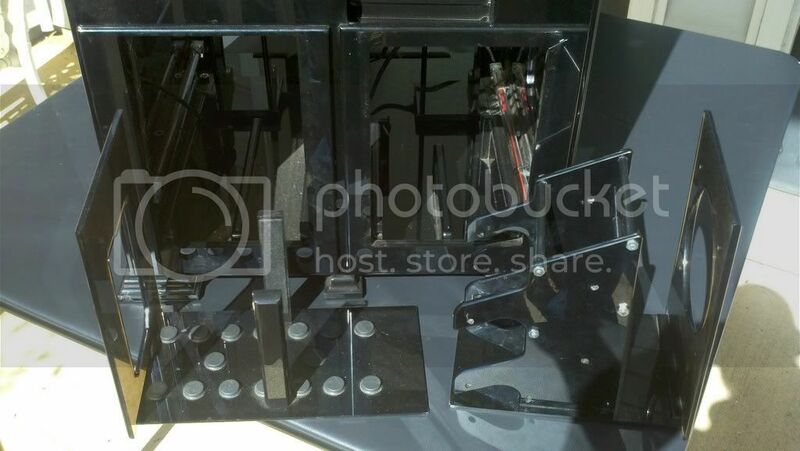 July 13, 2014 - Some HD shots of everything running and bolted down. Mostly finished at this point minus final wiring, mounting the plaque, and prepping for Quakecon. 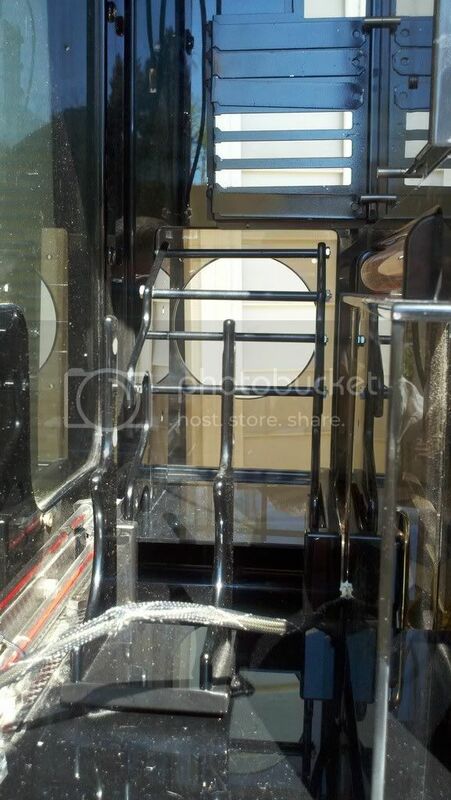 July 16, 2014 - Officially on the road to Quakecon: packing up the rig and making a cart to carry it! July 17, 2014 - Finally AT QUAKECON! In line at the registration for the BYOC. July 23, 2014 - Back from Quakecon and fixing what broke on the ~1100 mile road trip and upgrading PSU and new free goodies from Qcon! July 24, 2012Zacbrain's pictures of the case from Quakecon. So perty! I decided to post some pics from across the thread here at the bottom for new lookers wanting to quickly glance through and see what's been going on. If any of these pics interest you, check the update list above to see the whole thing. 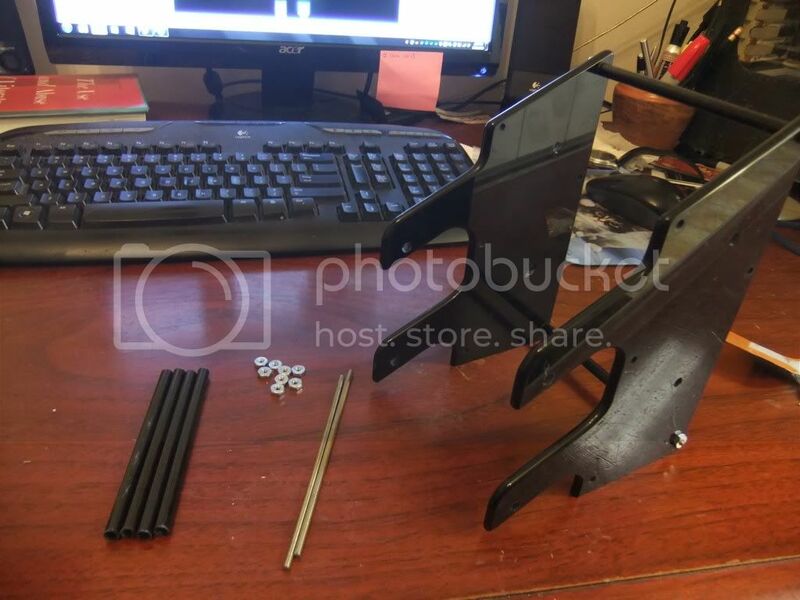 As I said, some of the parts were broken: the HDD rack, the PSU mount, one of the motherboard CCFL light ends, and the bottom piece of the optical bay piece. I glued the misc parts back where the should be and set out to reassemble the HDD cage. This thing is masterful. I had to go back over and over Syrillian's images to see how he had it put together, lol. This was how it arrived to me (ignore my kitty mousepad, it's a long story from a LAN party ). Here is it starting to come together. Syr used acorn nuts but until I order some, I went to Lowes and bought some generic nuts. 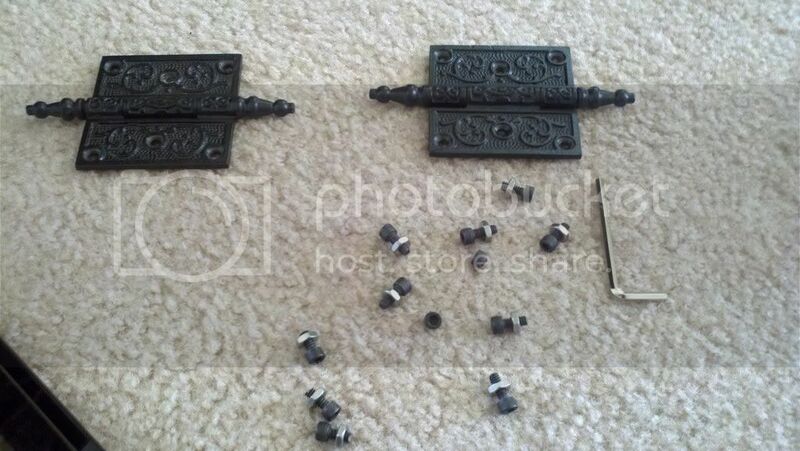 I'll end up ordering a few things as there are various bolts missing here and there. I'll also require the use of some of you to help me identify the specific types as I've only used regular motherboard screws on most of my things, lol. Anyway, here it is. 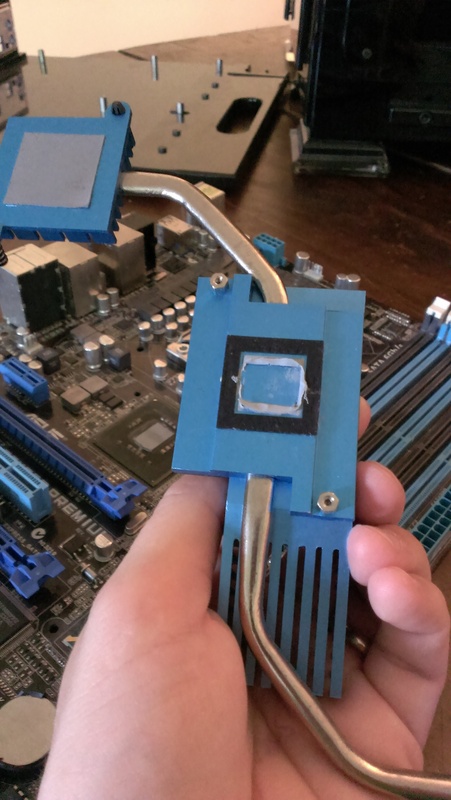 There was also the PSU tray. Below is the picture of it broken. I simply glued it back together. I don't have an after pic, sorry! 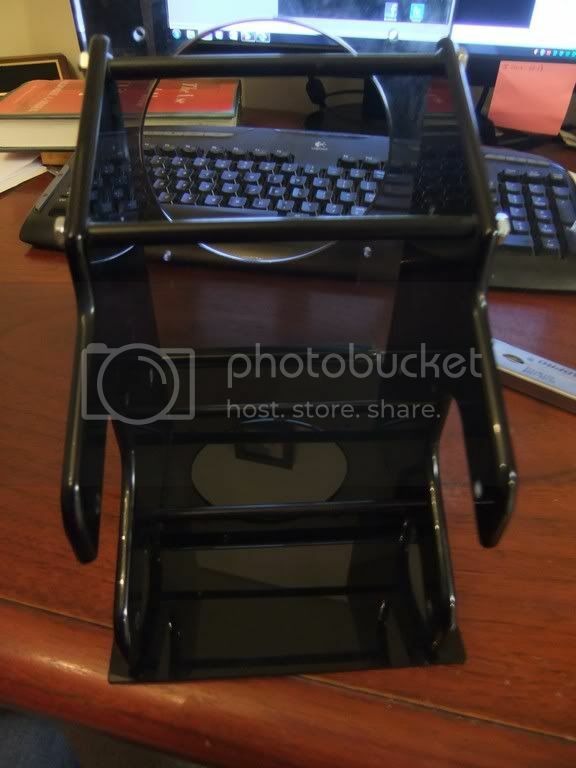 Below are the pictures of the case as it stands (no pun intended ). Sorry for the OK quality, these are from my DroidX. The digi cam is at work with my wife, lol. This thing is HEAVY. I hate to think what it weighed with two 480 rads worth of water in it. And I see now about the trouble of taking pics of this case! 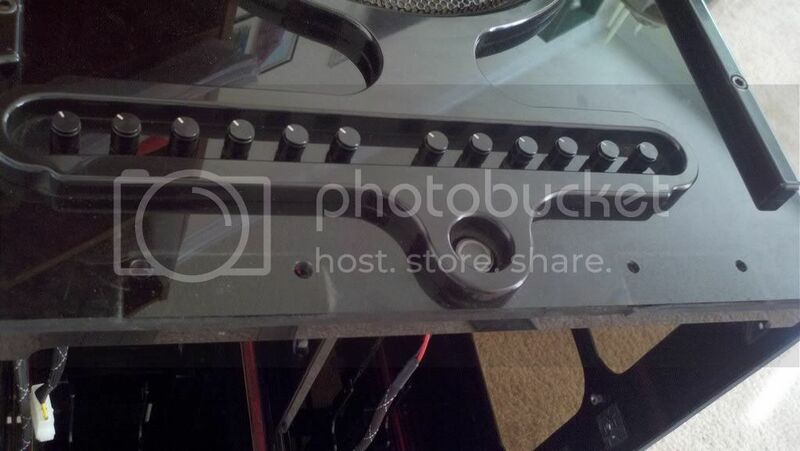 The acrylic is highly reflective. The interior. As you can see there are wires askew and stuff. Two of the CCFL power inverters were missing and I had to get some spares Underdog had. 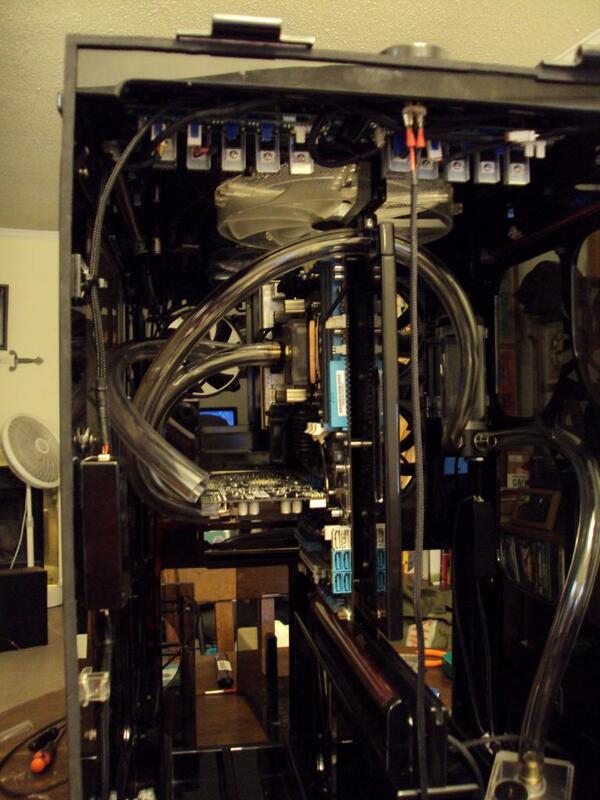 The motherboard half with HDD rack and pump stand. 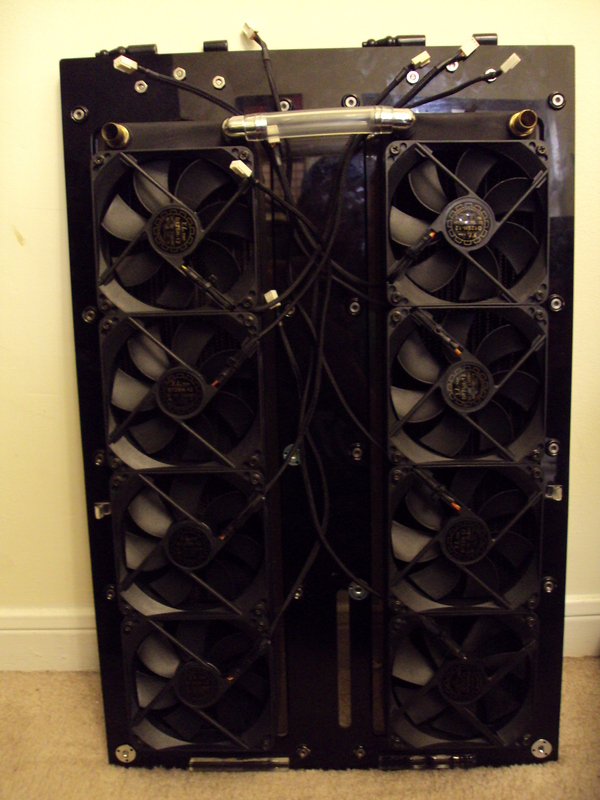 The PSU side with PSU rack and pump stand. 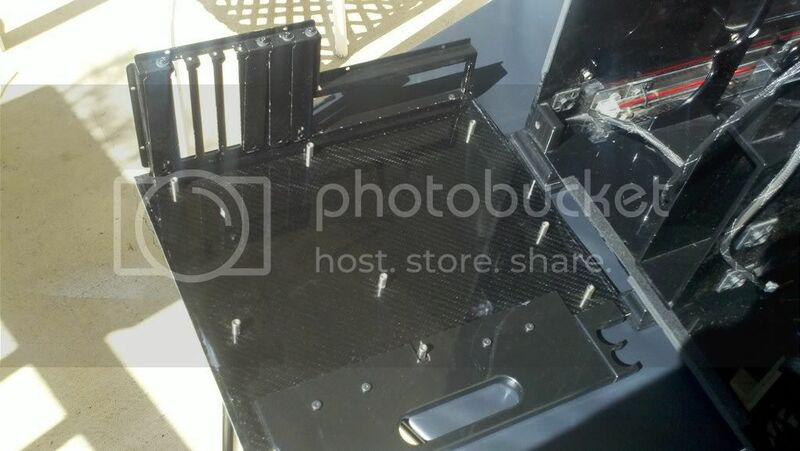 The beautiful carbon fiber motherboard tray. How the tray slides in. This is such a work of art. 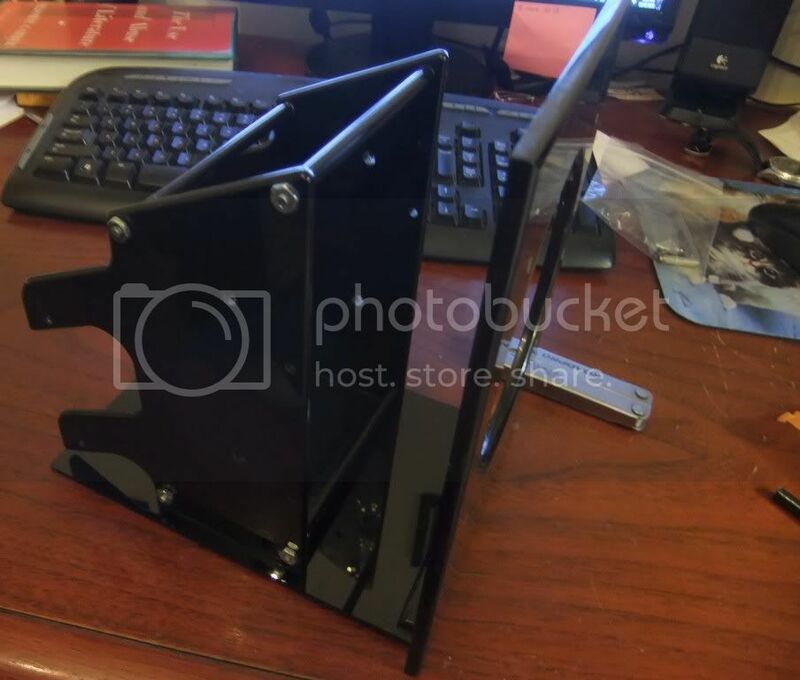 If I had ever built a mounting system like this AND the back panel for it, they'd never (ever) line up as well as this does. The man was a true craftsman. The vandal switch, fan controllers, and 230mm ceiling fan as I call it. Here are the two trays half way out. They're so elegant and simple. And here they are taken out. 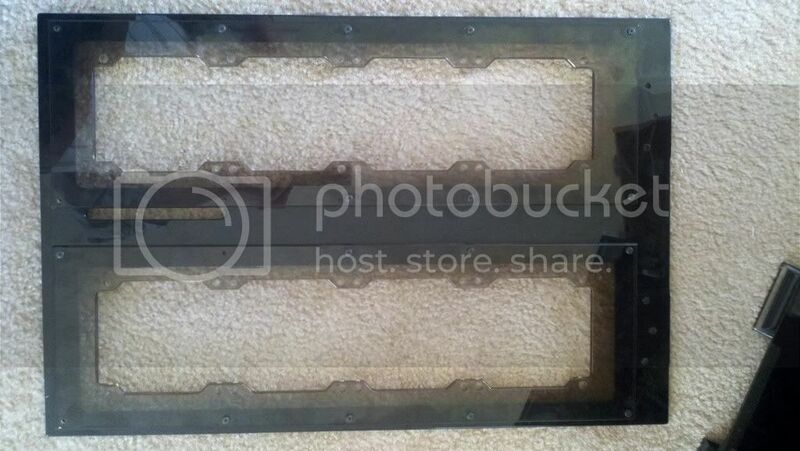 The trap door for the res (which I need to buy, the original one is missing). Does anyone know what brand/size Syrillian used? That's all for the complete shots. Next I'll begin the updates on the hinges. After I'm done with the hinges, I can start buying tubing to retrofit my rig into it and getting the misc things I need. I was wondering what happened to that thing... nice to hear the minute details being done to perfect it. Not much to show on the hinges right now. Pretty much I just took them off today and will buy some bondo for them. Here they are taken off. And the front door without them. That's all I have to show right now. If you'd like a picture of something, let me know and I'll see what I can do. I'll keep you all posted! You're welcome Jobo! I'm glad I can! Yea, Smasher and Fish picked it up amongst other things. I'm really glad his gear went out to members and people who will appreciate them. I was afraid his family would just see them as "computer things" and donate them to the goodwill or something, haha. Agreed, I know he really wanted these hinges smooth. We were crushed when he got the ones I made and found out he had order the wrong size, lol. I went back through that entire log the week before I went to Texas and had so many laughs at our antics. Fun times! Overclock.net - An Overclocking Community > Case Mods & Cases > Builds, Logs & Case Mods > [Restoration] Syrillian's Silentium. 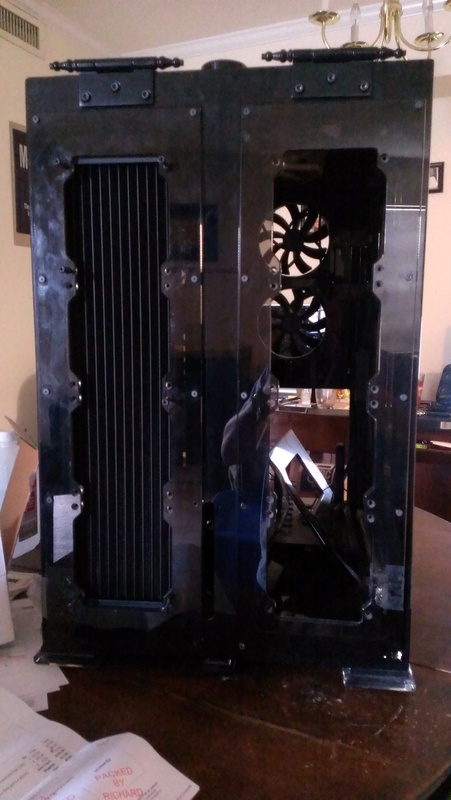 Dual 480mm rads, hand built acrylic case with carbon fiber. HEADING TO QUAKECON!